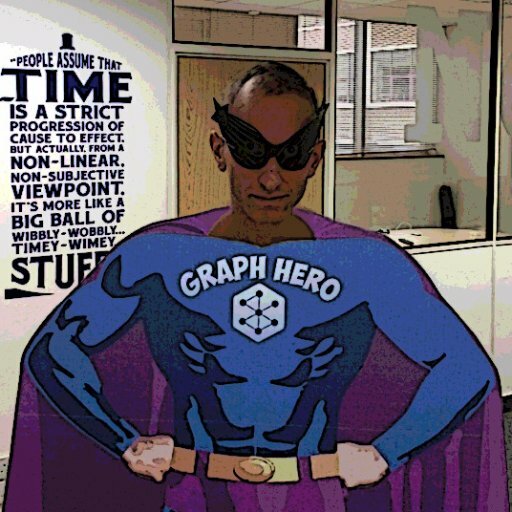 I’ve been running a few intro to Neo4j training sessions recently using Neo4j 2.2.0 RC1 and at some stage in every session somebody will make a typo when writing out of the example queries. For example one of the queries that we do about half way finds the actors and directors who have worked together and aggregates the movies they were in. It’s not immediately obvious why we aren’t seeing any results which can be quite frustrating. However, in Neo4j 2.2 the ‘EXPLAIN’ keyword has been introduced and we can use this to see what the query planner thinks of the query we want to execute without actually executing it. 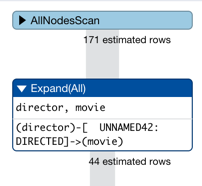 The first row of the query plan describes an all nodes scan which tells us that the query will start from the ‘director’ but it’s the second row that’s interesting. 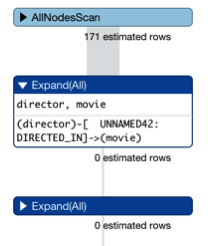 The estimated rows when expanding the ‘DIRECTED_IN’ relationship is 0 when we’d expect it to at least be a positive value if there were some instances of that relationship in the database. Here we see an estimated 44 rows from expanding the ‘DIRECTED’ relationship so we know there are at least some nodes connected by that relationship type. In summary if you find your query not returning anything when you expect it to, prefix an ‘EXPLAIN’ and make sure you’re not seeing the dreaded ‘0 expected rows’.